Once more info is released about the event, it'll be posted here. SO HAPPY FOR THE GIRLS!!!!!!! :cheer: I mean, it's the POPE!!! Decca Recording artist Three Graces is now confirmed to be among the top performers of the historic visit of His Holiness Pope Benedict XVI to New York this April. Along with superstar Kelly Clarkson, as well as Third Day and Toby Mack, Three Graces will be special musical guests at The Papal Youth Rally to be held on the grounds of St. Joseph's Seminary Chapel on Saturday, April 19th. The date also marks the third anniversary of the Papacy of His Holiness Pope Benedict XVI. Of their participation in the event, Three Graces comment, "We are honored and thrilled to be included in Pope Benedict's visit to New York, the city which we call home. We hope to give the performance of a lifetime." Three Graces is comprised of Sara Gettelfinger, Kelly Levesque and Joy Kabanuck. Their mix of the best of pop, Broadway, and opera creates a unique listening experience that transcends musicals boundaries. In Greek mythology, the Three Graces represent beauty, wisdom, and charm. Just like the legendary figures who inspired their name, these artists personify exhilarating talent. On their self-titled debut album released on March 4th, the trio explores a stunning array of styles and moods, singing in English, Italian, Spanish and French. The Washington Post recently lauded their "genuine vocal chops, pop savvy and camera-loving looks should take them far," while Pollstar said they will, "charm North America." The ladies are coming off of a very successful 20-city tour with British opera sensation Paul Potts, where they appeared as his special guest performing both solo material, and a duet with Paul. "Our sound is very full, very grand," explained Gettelfinger in a recent interview. "What makes us special is that we are able to have a sound as a trio but, at the same time, exist as individuals." Kelly Levesque elaborates, "We mix smart pop with a classical, grand sensibility." We are performing for the POPE!!! NEW YORK, April 2, 2008 /PRNewswire/ -- Decca Recording artist Three Graces is now confirmed to be among the top performers of the historic visit of His Holiness Pope Benedict XVI to New York this April. Along with superstar Kelly Clarkson, as well as Third Day and Toby Mack, Three Graces will be special musical guests at The Papal Youth Rally to be held on the grounds of St. Joseph's Seminary Chapel on Saturday, April 19th. The date also marks the third anniversary of the Papacy of His Holiness Pope Benedict XVI. Of their participation in the event, Three Graces comment, "We are honored and thrilled to be included in Pope Benedict's visit to New York, the city which we call home. We hope to give the performance of a lifetime." Pope Benedict's upcoming visit will feature many kinds of music - and one local organist helped choose what will be performed. NY1's Stephanie Simon filed the following report as our coverage of the Papal Visit 2008 continues. Inside St. Patrick's Cathedral, Music Director Jennifer Pascual plays Bach’s "In dir ist Freude” on the church’s large organ, preparing for when it will be performed during Pope Benedict's celebration of Mass in the church on April 19. But there will be an array of music styles celebrating the pontiff's U.S. visit. Harry Connick, Jr. is writing new music for the pre-Mass show at Yankee Stadium on April 20, and Pascual will conduct. “So [Connick] is opening the show with one of his works and he's closing the show with one of his works and at some point he's going to be sitting at the piano and playing and singing at the same time,” said Pascual. Pop star Kelly Clarkson will perform at the youth rally at St. Joseph's Seminary in Yonkers, as will the New York trio "Three Graces." “They were looking for something that was very uplifting and optimistic, but also something that was new and sort of epic,” said Three Graces member Sara Gettelfinger. But all of the pop music is really to entertain the audience before the pope arrives at each venue. Pascual selected nearly all of the music to be played for the pope. She did some research with New York Archbishop Edward Cardinal Egan. As Dr. Pascual plans and coordinates all of the music of the pope's visit, there's an added pressure because the pope himself is a musician. While Pope Benedict will be the first pope to celebrate mass at St Patrick’s, Pascual is also especially excited about the mass at Yankee Stadium. Irish tenor Ronan Tynan, famous for singing the national anthem at the Yankees’ home games, will also perform. Let's get this clear from the beginning: Harrison native Kelly Levesque is no overnight sensation. Sensation, yes. And her star is about to go supernova as one-third of a new supergroup, Three Graces. How super? Three Graces will sing for Pope Benedict XVI on Saturday in Yonkers on a bill that includes Kelly Clarkson. But overnight? That's not the way the music business works - even on "American Idol." Levesque started singing when she was 3, doing jingles in her dad's post-production recording studio. Her first album: "Jokes, Riddles & Silly Songs" for Golden Books. One of her first tracks: "Old McDonald." The Graces - with their first tour behind them and a CD just released - have the flash, looks and style to grab your attention. But if that's the first thing you notice about the trio, their music and three-part vocal power will keep you tuned in. The introduction: Levesque is the pop singer. Joy Kabanuck is the opera singer. Sara Gettelfinger is the Broadway belter. This is no teen-popera crossover group. Brought together by execs at Decca Records, each of the Graces knows success. Kabanuck played Mimi in Baz Lurhmann's production of "La Boheme," among her opera roles. Gettelfinger starred in "Dirty Rotten Scoundrels," among her Broadway roles. Singer-songwriter Levesque (pronounced le-vek) sang with Andrea Bocelli during his last U.S. tour and has performed with Josh Groban. Her songs "Lovin is Easy" and "El Equilibre" hit the Top 10 in England and France. She also starred as Sandy in the Harrison High School production of "Grease" opposite Eric Kizis, who, she believes, now runs a DJ company. As president of the Footlight Players, she also appeared in "Brigadoon" and was Catherine in "Pippin." Levesque started writing music in high school, and even when she signed her first record deal in 1998, she says, she would have been satisfied being a writer-producer. "I wanted a say in what I was singing," she says. "Being able to get your words out, even with someone else singing them" was the attraction. But a very different girl group, the Pussycat Dolls, came calling. She did 10 weeks as the lead singer, when the group was a hot Las Vegas showroom fixture, before TV and recording fame. "I did all the choreography, full-on dancing and singing," she says. "They wanted me for six months, but I couldn't step away from the recording business for that long. "Vegas was interesting," is the way she recalls the experience. So was working with Josh Groban. "We're the same age," she says, putting herself at 27, if you do the math. "He's kinda like me, a perfectionist. I really respect that." Singing with Bocelli meant singing in front of 19,000 people nightly. "He's seriously an angel," she says. "Just to stand onstage with him ... I was in awe. I see videos of me onstage, with such a smile. 'Come on, Kelly. Singing with the Boston Pops?'" Levesque says the making of Three Graces - David Novik, one of the executive producers, remembered her from an audition when she was 18 - began with something called smart pop. "It's not like there's a lead singer and background signers," she says. "We each get a spot on each song." The result isn't popera, the blended genre that Bocelli leads. It's both extreme pop and opera, filtered through more popular songs - including two credited to the Graces, and Phil Collins' "Against All Odds." The three voices weave together and in close harmonies that suit anthem rock, American standards and the kind of soaring trios in Spanish, Italian or French that give them an international feel. "To get our sound together, we wrote for about 1 1/2 months before we started recording," Levesque says. "We like to keep our songs very general. We want it to mean a lot of things to different people - even among the three of us. "We were extremely lucky as new artists. We had 100 percent input in picking what made the album. We went through hundreds of songs in very long listening sessions." The Graces road-tested their approach in a monthlong, 20-city tour opening for British opera tenor Paul Potts. He'd open, they'd do a set, then he'd close. "After intermission, he'd do three songs, then we'd do the duet from 'Traviata' (in three parts, of course). We didn't want to disappoint opera fans. "The first night we did it in Hollywood, Fla., we got a standing ovation. We just sang opera and got a standing ovation. How cool is that? And Joy got to sing in her opera voice." To blend their solo styles, Levesque says, each of the Graces trims back a little - for example, giving up the Broadway vibrato. "I knew very little about opera" before working with Kabanuck. "The way vocalists sing, opera [voice] is back in the head. The breathing is more open. "I'm a belter. My [voice] placement is so different. You never have to sing over an orchestra, you always have amplification." From Broadway, Gettelfinger brings her work ethic along with her voice. "Doing Broadway for 12 years, eight shows a week, you don't call in sick," Levesque says. "If you're puking, there's a bucket on the side of the stage. You made a commitment." That commitment takes them to the Papal Youth Rally Saturday at St. Joseph's Seminary Chapel. "I'm so excited for it," Levesque says. "It's the pope and he's in Westchester. "We get to stand onstage with him after we perform," she says. "Which means shoulders and knees covered." Levesque will head to St. Joseph's from her home in White Plains. Look for her at The Westchester, where she's a regular. Or CVS, she says. But first, she's one of the Three Graces. "This is the next stage of my life," she says, looking at a five-year run. "If it hits the way I hope it will." Reach Bob Heisler at rheisler@lohud.com or 914-694-3507. Greenwich native Kelly Levesque has performed for all sorts of audiences in her singing career. The biggest audience she'll face will be tomorrow night when she performs for Pope Benedict XVI and 20,000 young people. "It is going to sink in (tonight) with the sound check," Levesque said. "Being a Catholic and being asked to perform at this youth event, I'm still kind of in disbelief that we're doing this papal event." Levesque is a member of the singing trio Three Graces which was invited to perform at the youth rally and prayer service at St. Joseph's Seminary Chapel in Yonkers, N.Y. Three Graces will perform three songs as the opening act for pop singer Kelly Clarkson. The 28-year-old Levesque, a pop singer, predicts her performance with song mates Broadway veteran Sara Gettelfinger and opera singer Joy Kabanuck will be a day to never forget. "It is without a doubt, a once-in-a-lifetime event," she said. Each woman put their solo careers on hold two years ago after music industry executives suggested they try to meld their respective styles and sounds, and record a song together. "Musically, we're interesting. I'm the pop singer," explains Levesque during a telephone interview from her White Plains home. "Musically, we are completely different but surprisingly it does work. The record company (Decca) introduced us two years ago and we hit it off. It is something nobody has ever done before, have all these different musical textures." Tomorrow's performance caps a whirlwind of accomplishments in recent weeks. Last month, their first album -- "Three Graces" -- was released. That was followed by a 20-city concert tour with the British opera star Paul Potts with performances throughout the United States, Canada and Mexico. A Washington Post reviewer described them as having "genuine vocal chops, pop savvy and camera-loving looks." Then they were invited to perform two songs live on the April 5 "Early Show" on WCBS television in New York. And now, it's a performance for the 81-year-old pontiff who is coming to New York for a weekend of religious celebrations including a Mass on Sunday for 57,000 faithful at Yankee Stadium. Levesque, who was raised in Harrison, N.Y., and attended Purchase College before heading to California to pursue her music career, says the trio will perform three songs, which church officials have approved. She jokingly described them as "P-rated, pope-rated." The songs -- "You'll Be Watching," "Si Accendera," which will be sung in Italian, and a song they co-wrote, "I Wish" -- Levesque said, are "uplifting because it is for youth and the Pope." Levesque, who visits Greenwich often because she has relatives and friends there and "loves" shopping on Greenwich Avenue, says she's proud of her accomplishments and isn't surprised that she is achieving her goals. "I have gone from working 10 weeks in Las Vegas with 400 people in the room to singing with Andrea Bocelli with 19,000 people in the audience with the Boston Pops, a 100-piece orchestra, behind us" during Bocelli's East Coast tour nearly two years ago. "I have imagined this year coming. I always have hoped for and dreamed it. My dreams are pretty big É my dream personally is to touch people through my music -- the lyrics and the music -- to help people through difficult times. Every moment in my life I can relate to a particular song," Levesque said. "Music is powerful and I want to connect to people via the music." With tomorrow's youth rally, Levesque will be making that connection. Besides the 20,000 in the audience, the rally which will include performances by the Atlanta-based rock band Third Day, the pop rock rapper Toby Mac, and Clarkson, will be beamed around the world via satellite. "It's going to be worldwide which I'm going to try not to think about. But I'm pumped, very excited," she added. It's good to see Kelly doing her best! I am so excited, it is today the girls are performing for the Pope Good luck to the girls, hope we will get some reports in here! Thanks for share it regina! Well everyone I tried getting to the event, but I couldn't get in so I figured I would stand outside. As everyone said the girls sang around 3 in the afternoon and I was on my way to the venue at that time I was able to hear I Wish though but only because my mom was watching it at home and she put her cell phone to the TV. :lol: :lol: :lol: :lol: So even though I really didn't get to see the girls I was close to the pope so that was a positive for me. So last night I watched all of the different local news broadcasts and NO mention of the girls whatsoever. They talked mostly of just Kelly Clarkson. I'll keep checking. 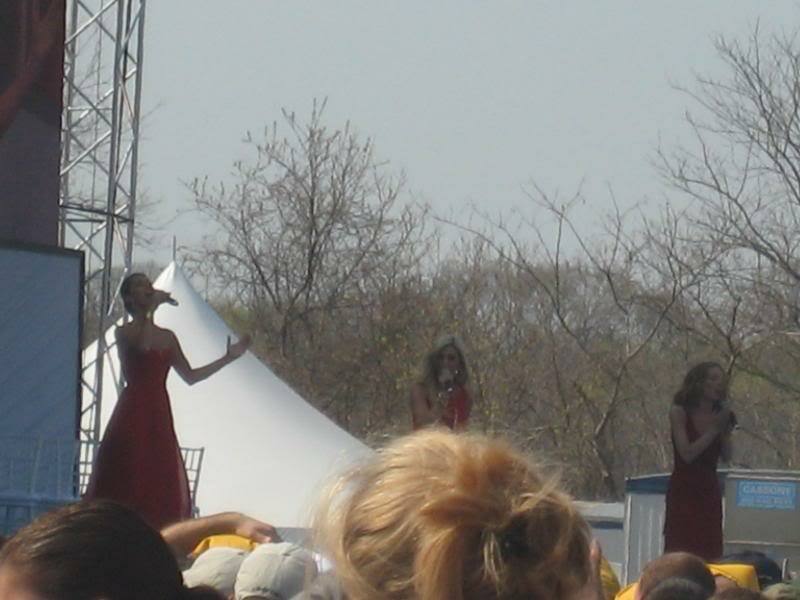 Oh and one of my friends was at the rally and got photos of the girls. I'm just waiting for her permission to post them on here. Thanks Anna on myspace for these photos!